FILE PHOTO: U.S. 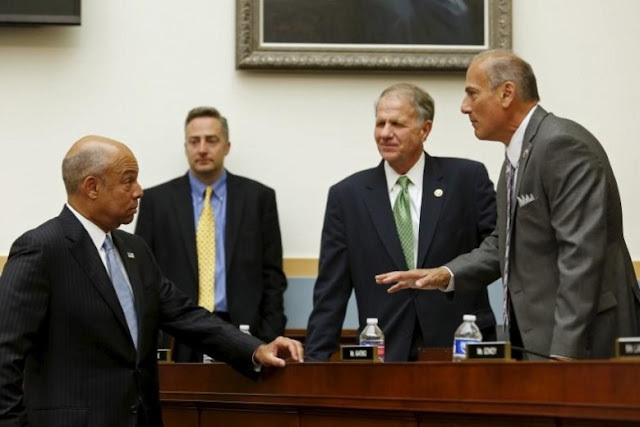 Homeland Security Secretary Jeh Johnson (L) listens to Representative Tom Marino (R-PA) (R) before a House Judiciary committee hearing on the 'Oversight of the US Department of Homeland Security' on Capitol Hill in Washington July 14, 2015. WASHINGTON - President Donald Trump said on Tuesday that Tom Marino, his pick as the U.S. drug czar, has withdrawn after it became public that the congressman advocated for legislation undermining the government’s ability to crack down on pharmaceutical companies that play a role in the nation’s opioid crisis. Trump had pegged Marino, a Pennsylvania Republican, to lead the Office of National Drug Control Policy, a post that required Senate confirmation. The Trump administration has taken criticism for its response to the opioid epidemic. Trump said on Aug. 10 he would declare the opioid epidemic a national emergency, but has not yet done so. Such a declaration would help unlock resources including additional funding and expanded access to various forms of treatment, and would give the government more flexibility in waiving rules and restrictions to expedite action. The U.S. Centers for Disease Control and Prevention said that 33,000 deaths were linked to opioids in 2015, the last year with publicly available data. The Washington Post and CBS News published an investigation on Sunday that showed that Marino had worked to weaken federal efforts to slow the flow of opioid drugs. U.S. Vice President Mike Pence said the administration continues to think “very highly” of Marino. A spokeswoman for Tom Marino’s office said the congressman had no immediate comment. President Donald Trump said on Tuesday that Tom Marino, his pick as the U.S. drug czar, has withdrawn after it became public that the congressman advocated for legislation undermining the government’s ability to crack down on pharmaceutical companies that play a role in the nation’s opioid crisis.